In the second installment of my monthly post where I get to gush over the girls in my life who inspire me every day, I'm featuring Hannah Robinett, designer and side-business-woman extraordinaire! 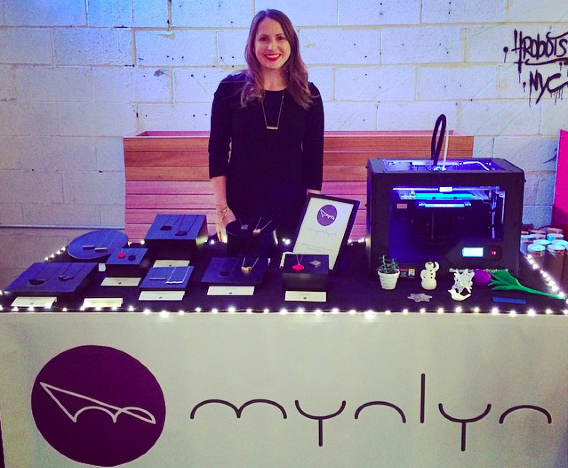 Hannah is the founder of mynlyn, a 3D-printed jewelry line based out of Brooklyn. Another fun fact: she's one of the links that brought me and my husband together. But that's not the only reason I love her. She's also one of the sweetest, funniest girls I know. Q: So, can you explain the process of 3D printed jewelry to those of us who are intrigued but have no idea how it actually works? A: First, I just sketch a bunch of designs -- these may not necessarily be ring designs or necklace designs, just something I consider a work of art. And then I work in a program where you can design 3D and turn it into something wearable and tangible. I then use a maker bot, which is an at-home 3D printer, where I can print out all my prototypes. It's kind of a long process getting every step to be what I want it to be. Q: That's interesting that you don't always design specifically for jewelry first. A: A lot of pieces from my original line were taken from my works of art before I was even designing jewelry. I just looked at that work of art and made it into a piece that someone could wear. It's works of art that you can wear! Q: Did you get the 3D printer with this business in mind or did you get the idea after you bought it? A: I bought it with this idea. I just wanted to create more 3D products since everything I was doing was 2D, and I thought that a 3D printer would give me to opportunity to do that right at home. Q: But I know you don't only use the printer for jewelry... 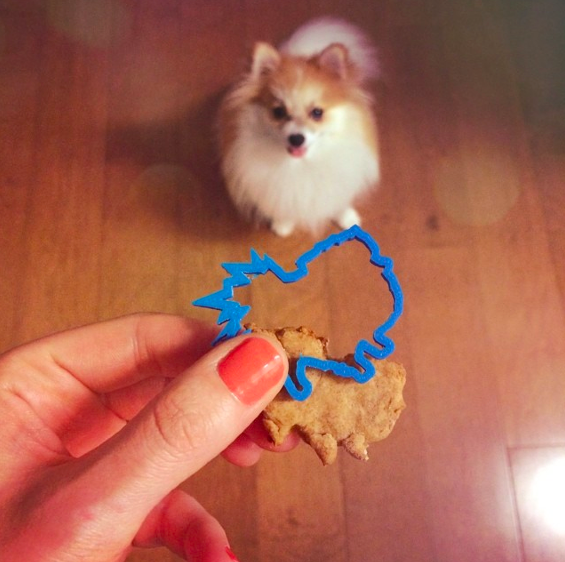 I've seen the adorable Gif-shaped cookie cutter you made. What else have you come up with? A: I try to make things I need around the apartment. Like, I made a jewelry tray. I also make a lot of toys for my goddaughter, niece, and nephew -- like little animal figurines, which probably take about 30 or 40 minutes to print. I made a flower pot to put some succulents in. It's fun to say, "What do I need?" and then you print it. I call the 3D printer the sewing machine of the 21st century because I feel like in another 20 years, I could see people just having them in their home and if they need a screw, they'll print a screw. If they need to fix a piece of a chair, they'll print exactly that piece. Q: OK, switching gears a little, one of my favorite memories with you was Googling monkey safety when we thought they were going to attack us in that outdoor hut in Thailand (of course they didn't because we were prepared). Just for fun, what other weird things have you Googled? A: I think I've asked Google a lot of weird things about my dog, like if he's got something weird with his leg or has stomach issues, and you know when you ask Google, it's like it's either a stomach bug or he has cancer, so I've learned to stop doing that. Q: Google always says it's the end of the world. Q: Speaking of Gif, what's he going to be for Halloween and is he going to be on Good Morning America again? A: We don't know yet. We have to get on that! If you guys have any Halloween costume ideas for that cute little fluff ball Gif, let us know in the comments! And be sure to check out Hannah's jewelry line here! PS- She set up an exclusive code just for you guys to receive 25% off of your order at her shop. Type in the code JULIEPENS25 at checkout! How sweet is that? 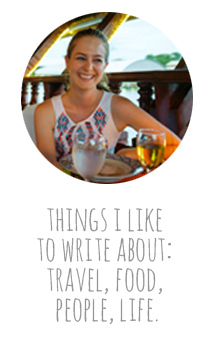 Want to be notified when a new blog post goes live? Enter your email address in the form below, and I'll add you to the list!